This is an important survey of Norfolk’s parish churches that are no longer in use. 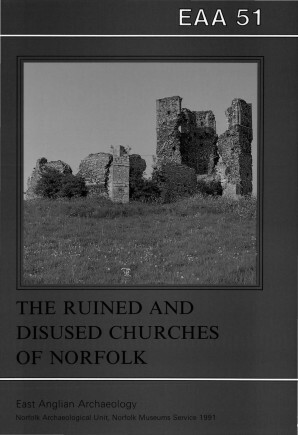 It charts the changing needs of Norfolk’s parishes through time, by illustrating the great periods of building and decline, and suggesting some causes behind the abandonment of these varied and intriguing buildings. The fates of the parish churches discussed here are varied, from complete preservation of all fabric and fittings through to total loss. Individual histories of thirty-six selected churches are told. Churches were burnt down through sheer accident by sparks from a workman’s pipe, or tom down by landowners and even vicars; sometimes the village that supported the church shrank or moved, although others are now kept alive by congregations who are willing to travel.